I got another award! Yippeeee! 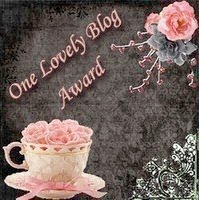 I was gifted THE ONE LOVELY BLOG AWARD by Maria at Fly High! Thank you! Thank you so much for the award, I really appreciate it! Thanks so much! I'll get a post up on my blog about it as soon as I can. You're posting like mad these last couple of days. I'm jealous and I need to catch up here.